Reflecting on the battle of Montgomery, Sir Thomas Myddelton, who had jointly commanded the victorious Parliamentarian army, later described it as: 'as great a victory as hath been gained in any part of the kingdom'. Fought on 18 September 1644 in mid Wales, Montgomery was the largest engagement in the Principality during the First English Civil War of 1642 to 1646. In terms of numbers engaged, in its outcome and impact, it was also a particularly significant regional battle of the war. Notwithstanding its importance, historians have largely overlooked Montgomery. Consequently it is rarely mentioned in studies of the mid seventeenth-century British Civil Wars. Moreover, where attention has been accorded to the battle and the preceding campaign both have often been sketched over or misinterpreted. To fully explain the course and context of events, "The Battle of Montgomery, 1644: The English Civil War in the Welsh Borderlands" therefore presents the most detailed reconstruction and interpretation of this important battle published to date. An addition to Helion & Company's Century of the Soldier series, comprising titles breaking new ground in exploring seventeenth-century military history, The Battle of Montgomery similarly adopts a fresh approach. Making extensive use of contemporary sources - many of which are referenced here for the first time - the campaign, the armies and their commanders are fully considered before the battle is investigated; here, because the site has not been certainly located, the author uses fieldwork and archival information to propose the most likely battlefield, before examining the course of the engagement in the context of contemporary tactics and weaponry. While the battle is the main subject, Montgomery, 1644 also considers the wider war in northerly Wales and the northwest and west midlands of England - a region that remains underrepresented in Civil War historiography. 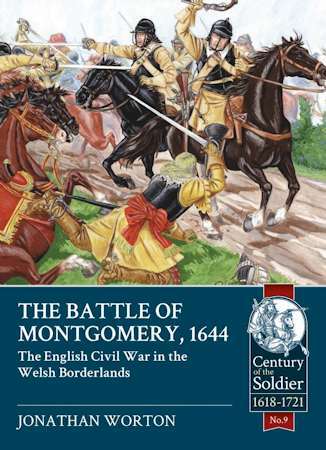 Extensively illustrated, including specially commissioned artwork, The Battle of Montgomery, 1644: The English Civil War in the Welsh Borderlands will be welcomed by readers interested in the history of the British Civil Wars; by living history enthusiasts of the period; by wargamers and model makers; and by those curious about the history of Wales and the English borderlands.